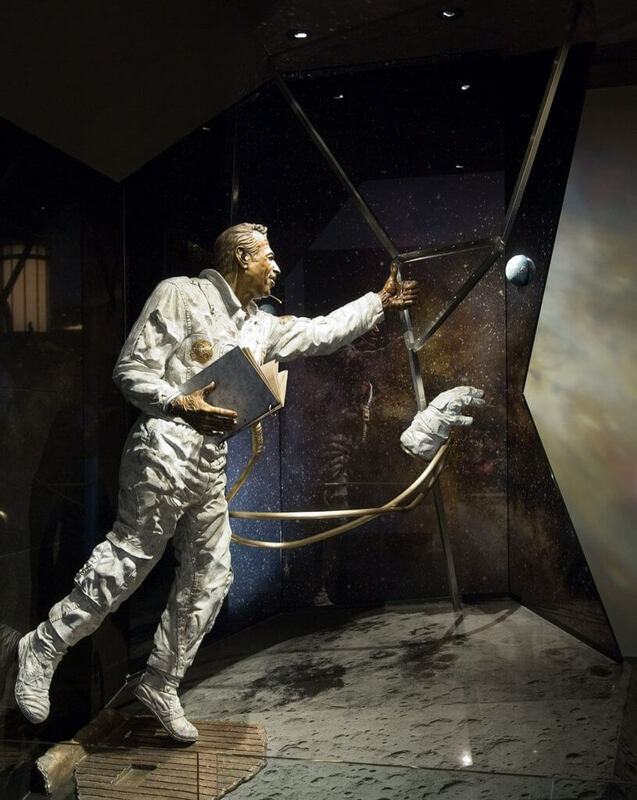 The Adler Planetarium on Northerly Island in Chicago is the home of Quest for Exploration, our sculpture installation of Apollo 13 captain James Lovell. The sculpture depicts Lovell floating in the Apollo 13 lunar module above the moon’s cratered surface, with the earth spinning calmly in the distance. Lovell holds up his thumb to measure his home planet while his glove floats nearby, symbolically reaching to the future of space exploration and the human pursuit of knowledge. Lovell’s face is expressive, his mouth slightly open as if to speak, or perhaps gasping in awe of the magnitude before him. A hose also floats near Lovell, tracing the figure-eight trajectory that Apollo 13 followed to the moon and back in April of 1970. Their mission was to explore the moon’s Fra Mauro formation, but never landed due to the explosion of an oxygen tank – still, the Apollo 13 mission is widely regarded as “NASA’s finest hour.” Cradling his logbook, Lovell is encased in the geometric glass alcove through which we can see beyond to Earth and the stars of the Milky Way. In the words of Julie Rotblatt Amrany, “Portraiture in our work goes beyond the traditional likeness of a person. It embodies the inner soul, it truly feels alive, and captures the figure in its essence of movement. The soul of a human being is as expansive as the outer universe.” Quest for Exploration: James A. Lovell is perhaps the greatest expression of our philosophy, as Lovell leans toward the earth, reaching for the stars. The Adler Planetarium is Chicago’s premier planetarium. Current exhibitions include the art exhibit The Worlds of Chelsea Bonestell, a history of astronomy in culture, a gallery of famous space explorers, astronomers, and cosmologists, and other exhibits illuminating the night sky as we would see it without the light pollution of modern cities. The museum also hosts a range of activities for kids and teens, including overnight sleepovers, after-school hangouts, citizen science experiment classes, and collaborative sessions between students, charities, and web developers. For adults, Adler hosts lectures, a series of themed cocktail parties called Adler After Dark, and even a yoga class, as well as live shows. The Adler Planetarium’s mission is to inspire exploration and understanding of our universe. What better to embody this concept than a Rotblatt-Amrany sculpture?